So here’s the trick to achieving fabulous lashes: make sure there’s not too much mascara on the brush before applying it – if there’s too much formula on the wand, your lashes are likely to get all gluggy (fun for the runway if you’re channelling Twiggy, but best avoided otherwise!). 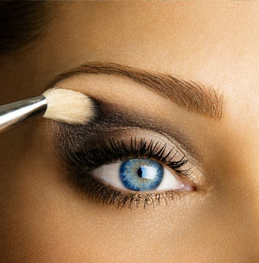 When you apply the mascara, really wiggle the wand up and down lashes to separate and spread them. Jay Jay’s secret tip: For instant wow-factor, add three or four clusters of individual lashes at the outer lash line. Just make sure to use black eyelash glue if you do this. I love the dark tone glue by Duo ($22, available from Kryolan).